St Ives watersports for your holiday in Cornwall: take the plunge! Your Cornish seaside holiday wouldn’t be complete without trying an activity on or in the water. There’s lots of St Ives watersports to choose from, so get ready for salty hair and sandy toes! As soon as St Ives comes into view for the first time, whether from the car window or on the scenic train journey, you’ll immediately want to jump into the crystal clear waters. Luckily, there are lots of St Ives watersports to choose from. This little piece of paradise in West Cornwall is the perfect place for a fun-filled watersports holiday. Let’s jump in…. 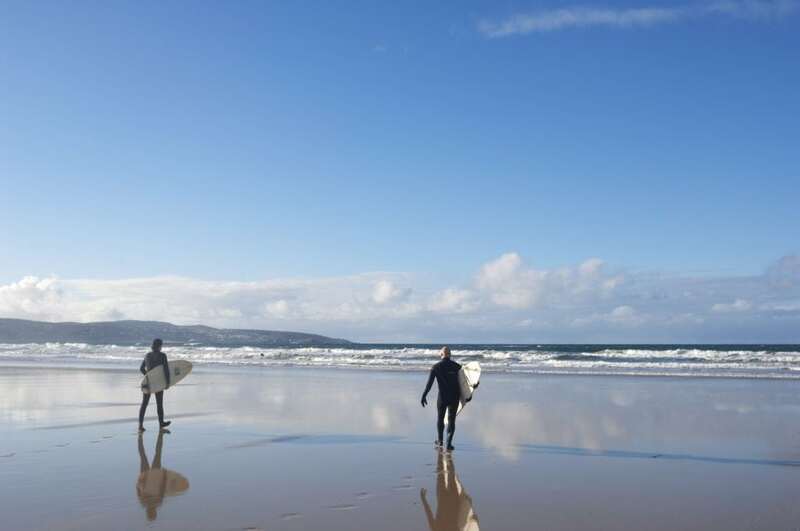 A holiday in St Ives, Carbis Bay or the surrounding areas is the perfect base for learning to surf. St Ives Surf School on Porthmeor beach is one of the best surf schools in Cornwall. The experienced instructors offer lessons to beginners, improvers and advanced surfers. Learning to surf will give you an experience you’ll never forget. You’ll have lots of fun trying to stand up and catching a wave for the first time is an exhilarating experience. You can hire wetsuits from the surf school and after your session you can warm up with a coffee at Porthmeor Cafe and hopefully soak up some sun! Surfing can be an empowering experience and, even if you don’t manage to catch a wave at all, you will have had a fun and memorable experience trying! Find out more about surfing in St Ives here. If the thought of standing up on a board makes you feel dizzy, why not have a go at bodyboarding instead? Riding a wave on a boogie board can be just as thrilling as surfing and it’s a lot easier! Porthmeor is a blue flag beach and is ideal for both surfing and bodyboarding. You can hire bodyboards from St Ives Surf School and wetsuits as well, unless you want to brave the Cornish waters in your swimming cossie! Bodyboarding is quite easy once you get the hang of it. Simply watch the waves and try to catch one just as it’s breaking. Lean slightly forward on your board and let the ocean carry you to the shore! Just one word of warning: you probably won’t want to stop, it’s too much fun! This is also a great beach activity for kids and waves can be caught in shallower water too. Just make sure you stay in between the red and yellow flags, rather than the black and white flags which indicate the surfer’s area. Try to find a spot that isn’t too close to anyone else and watch out for other boards zooming towards you! Bodyboarding is one of the St Ives watersports that the whole family can try! Stand up paddle boarding or SUP has become one of the most popular watersports in recent years. It originated in Hawaii as a different way to surf waves, but people paddle board on lakes, rivers and canals, as well as in the sea. 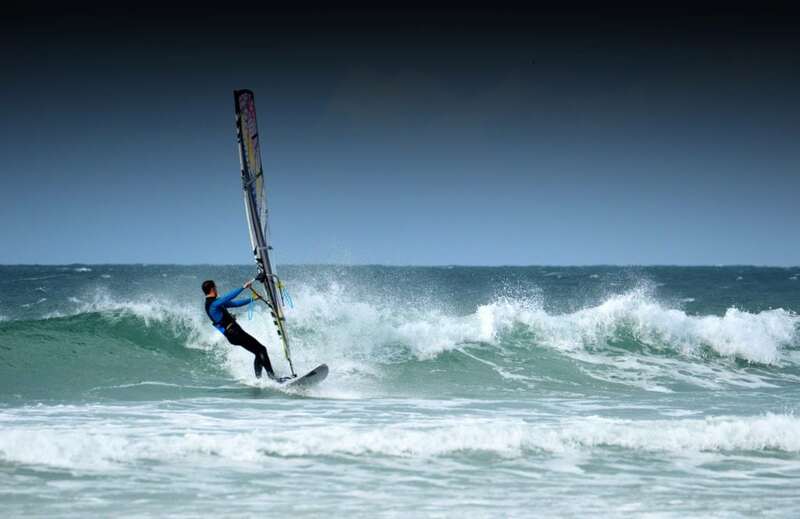 It’s now thought to be the fastest growing watersport in the world and is one of the most popular St Ives watersports. St Ives Surf School also offer paddleboarding lessons, but rather than Porthmeor where the surfing takes place, SUP lessons happen at Porthminster beach. 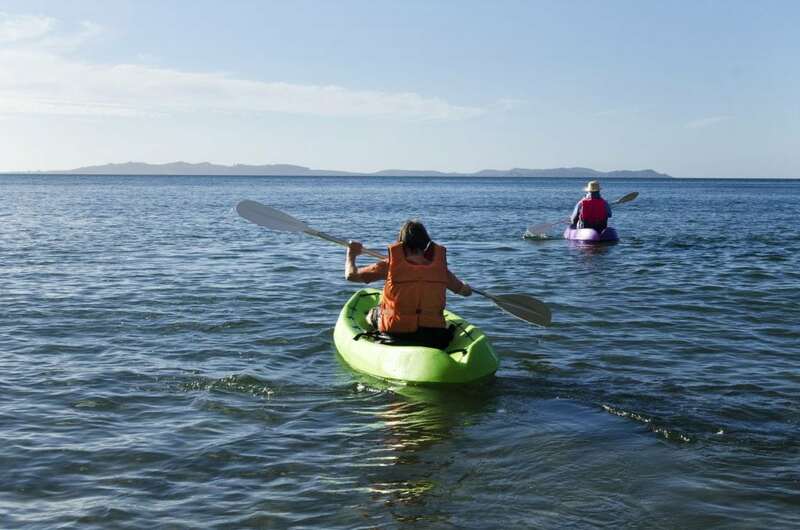 They offer beginner’s lessons, guided tours for experienced paddlers, or the opportunity to hire them out for the day to embark on your own adventure. Paddle boarding is also offered on Carbis Bay beach at Ocean SportsCentre where you can choose from tons of different lessons including starter, improver, cruiser and surfer. Alternatively, you can hire boards for an hour or a day. If you’re a complete beginner, you’ll start by learning how to paddle on the board lying down and using the paddle to propel yourself forwards whilst in a kneeling position. Once you’ve learnt how to turn around and change direction, you will be encouraged to have a go at standing. Once up, be sure to bend your knees, look forward and keep paddling! But don’t worry if you fall off a few times, it’s all part of the fun! 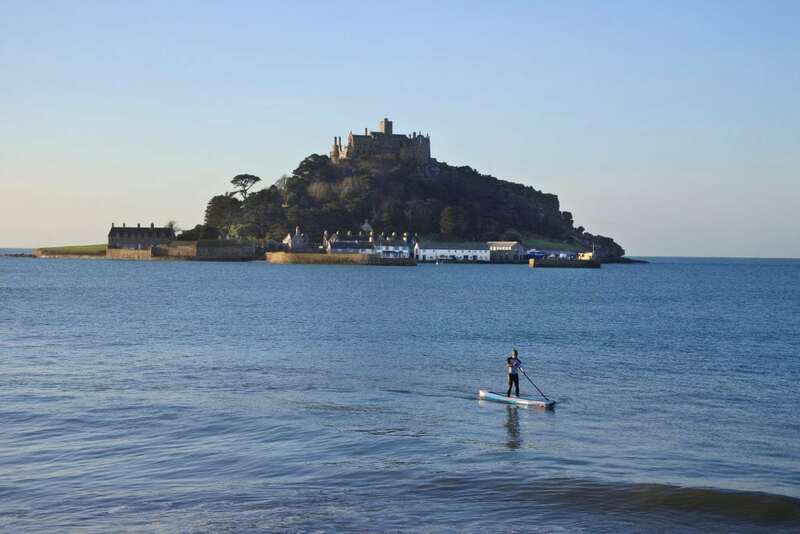 Once you get the hang of paddleboarding, it’s a more relaxed watersport which allows you to discover St Ives and the surrounding areas from a different perspective. Paddle across tranquil clear waters, explore hidden coves on the Cornish coastline and have an unforgettable experience on the water. There are a few options for kayak hire in St Ives. Firstly, there’s St Ives Boat Rides, located on the harbour opposite the Sloop Inn. This is a great place to hire from for a leisurely paddle around the harbour. You can also book boat trips here including fishing trips, rib rides and all sorts of exciting things. There’s also St Ives Watersports on Porthminster beach, St Ives Surf School on Porthmeor beach and Ocean Sports Centre at Carbis Bay. Unlike paddleboarding, you don’t have to have any previous kayaking experience to hire the kayaks and get out on the water. It’s a great activity for couples, families and groups of friends. You can have your own adventure out on the open water! Kayaking is a relaxing activity, but it’s great exercise as well. Discover the stunning St Ives scenery from the sparkling turquoise waters and enjoy the freedom of being out on the water. Paddling around is a great way of catching some rays, just make sure you slather on the sun cream before you begin exploring! The best place near St Ives for kitesurfing is Pasty Adventures Kite Surf School based in Gwithian and Marazion. They offer lessons for both beginners and advanced kite surfers taking place either at Gwithian beach with Godrevy lighthouse offering an amazing backdrop, or at Marazion and Long Rock beaches, with the beautiful St Michael’s Mount offering a spectacular setting. Pasty Adventures is West Cornwall’s only British Kitesports recognised school and has been running lessons since 2010. They provide all equipment including wetsuits. Kitesurfing can be tricky to master and is also dependent on wind and surf conditions. Beginners will ideally need flat water conditions whilst more experienced kiteboarders go when there’s a bit more surf. The wind speed also needs to be roughly between 10 and 30 knots (12-35 mph). Kitesurfing is not only a great extreme sport for thrill-seekers, it’s also a great workout! It’s great for toning, coordination and concentration. During the summer, you don’t really want to be lying on the beach all day, it’s much better to get into the sea! Kitesurfing will cool you down and allow you to enjoy the sunshine at the same time. How about trying something completely different? 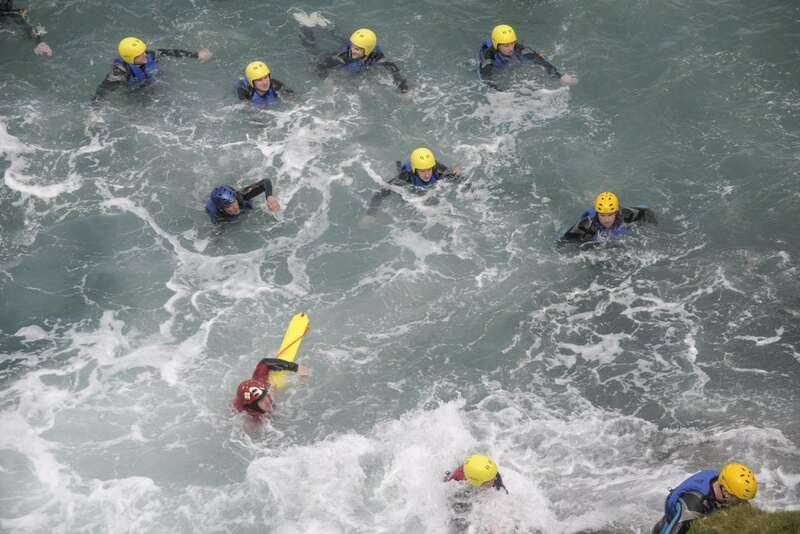 Coasteering is one of the more adventurous St Ives watersports, which is great for a group activity. Kernow Coasteering in West Cornwall offer coasteering in St Ives, Penzance and Praa Sands. If you’ve never heard of coasteering before, it’s basically a fun adventure activity that involves trying to get from one point to another by swimming, climbing, scrambling, rock-hopping, and cliff-jumping. As long as you’re a confident swimmer and reasonably fit, this is an awesome activity to try. You won’t be forced to do anything you don’t want to, you don’t have to jump or climb obstacles if you don’t feel confident; you can swim or scramble instead. This adventurous activity is popular with groups of friends and stag and hen dos. However, lots of people go in couples or on their own. The great thing about coasteering is that is can be done in all weather conditions. The experienced instructors can always find a more sheltered spot if the ocean is particularly ferocious. Coasteering is a great adrenaline activity and a unique way of exploring the rugged Cornish coast. As you can see, we’re spoilt for choice when it comes to St Ives watersports. Choose the ones that appeal to you and book a session, or if you can’t decide, why not try them all?! Whether you’re planning an action-packed adventure or a more relaxing holiday with a spot of bodyboarding and kayaking, find your perfect St Ives cottage or apartment and get set for some unforgettable ocean experiences.